According to a new market report published by Transparency Market Research titled “Microsoft Dynamics Services Market– Global Industry Analysis, Size, Share, Growth, Trends, and Forecast, 2018–2026”,The global Microsoft Dynamics Services market is expected to reach US$ 11,239.5Mn by 2026, expanding at a CAGR of 14.5% from 2018 to 2026. North America held a prominentshare of the Microsoft Dynamics Services market in 2016. Asia Pacific is projected to be at the forefront of global demand, and the market in the region is expected to expand at a significant CAGR among all regions. Rising adoption of cloud-based solutions and need for increasing operational efficiency, visibility, and productivity are acting as major drivers for the Microsoft Dynamics services market. Increasing demand among enterprises for reduction in operational costs, increase in business agility, and enforcement of mobility is playing an important role in the expansion of the cloud-based solutions globally.Enterprises are looking for Microsoft Dynamics cloud-based solutions to support ongoing cloud technology developments and integrate them with new systems to support digital projects.Furthermore, businesses across the globe are experiencing the benefits of automating manual tasks in order to reduce manual errors, utilize customer data for deciding what to offer, and driving efficient sales strategy.Businesses need to upgrade their systems and boost the operational efficiency in order to remain competitive.Organizations are implementing Microsoft Dynamics to streamline business operations and help employees work more efficiently. Microsoft Dynamics provides efficient communication and collaboration tools to help employees coordinate better within and across departments. The Microsoft Dynamics services market can be segmented based ondeployment type, product type, service type, end-user, and geography. Based ondeployment type,the Microsoft Dynamics services market has been further segmented into on-premiseand cloud-based. The on-premise segment held a prominent shareof the market in 2016. However,various organizations are looking for cloud based solutions especially from small and medium businessesowing to the rise in the number of mobile devices, cloud-based and IoT applications. Furthermore, a shift in preference of enterprise application buyers from traditional systems toward the cloud-first approach is expected to further boost the Microsoft Dynamics services market. Less maintenance and low costs associated with cloud-based Microsoft Dynamics services solutions aredriving the segment globally. Based onproduct type,the Microsoft Dynamics services market has been divided into ERP and CRM. 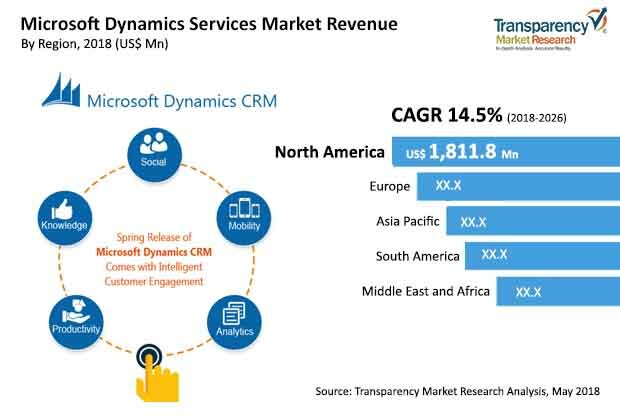 The CRM segment is expected to expand at asignificant CAGR during the forecast period.Based on service type,the Microsoft Dynamics Services market has been divided into advisory/consulting services, implementation, upgradation and migration and maintenance and support services. In terms of end-user, the Microsoft Dynamics Servicesmarket has been divided into BFSI, manufacturing, retail, telecom & IT, government, utilities, healthcare, and others. Based on geography,the Microsoft Dynamics Servicesmarket has been divided into North America, South America, Europe, Asia Pacific, and Middle East & Africa. North America is expected to hold a prominent share, and account formore than 40%of the global market in 2026, followed by Europe. Expansion of the Microsoft Dynamics services market in North America is owing to the increasing digital transformation within enterprises, rising adoption of AI and analytics and the high demand for latest technologies to reduce operation costs within enterprises. Furthermore,the market in Asia Pacific is expected to expand at a high CAGR ofmore than 14%during the forecast period, followed by South America. India, China, and Japan are among the major countriesthat held a dominant sharein the Microsoft Dynamics services market inAsia Pacific. Moreover, as a part of the strategy, severalservice providers are investing intools development specific to a particular industry and are focused on mergers and acquisitions in order to increase geographical reach in the global Microsoft Dynamics services market. Major players operating in the global Microsoft Dynamics services market include Tata Consultancy Services Limited, IBM Corporation, Capgemini SE, DXC Technology Company, Cognizant Technology Solutions Corporation, HCL Technologies Limited, Hitachi Solutions, Ltd., Infosys Limited, Wipro Limited, and Avanade Inc. Comparison matrix includes segment growth matrix, 2016 - 2026(%), segment revenue contribution, 2016 - 2026 (%), and segment compounded growth matrix (CAGR %). Market attractiveness identifies and compares segments market attractiveness on the basis of CAGR and market share index across North America, Europe, Asia Pacific, Middle East & Africa (MEA), and South America.